I don't know for certain, but I believe that any inspection port was added by the owner, not the factory. You can check with boat dealers (and maybe even Wal Mart...) if there is a common drain plug that fits. I know there are at least 3 sizes of the rubber and brass drain plugs. The middle size is the most common. I KNOW FOR CERTAIN that my local boat dealer has 3 sizes. I think you are right on the inspection ports. But since it's already there I plan to keep it. Comes in handy for sure. I'm not going to be thaaaaat strict on this "restoration". Thanks for the links! Those are cheap enough to experiment. There are some pieces in need of repair and a couple of small things missing. For the repair of the wooden parts, epoxy and sawdust from the sanding process works pretty well to repair holes and cracks in the daggerboard and rudder. Nice find, and good luck sailing! Thanks for the tips! I found you're blog last week via a google search and have read through a lot of it. Good stuff! I'm picking up some epoxy an spar varnish on Friday. It sounds like some people like the "better" stuff (things you can't get at Home Depot, Lowe's etc). Has anyone tried the Rustoleum (or similar) spar varnish? L&VW, interesting idea, but I'm fairly certain it would be very awkward to try to rotate a daggerboard and hold it steady at the bit location. plus, that would take many rotations of that large wooden piece to drill deep enough to insert the threaded rod or similar reinforcing. if I recall correctly, I clamped my boards down flat onto a table top, and then just kneeled down on the floor and held my drill with the long bore bit as level as I could while slowly drilling into and across the width of the wood piece. in retrospect, it may be wiser to make some type of guide/jig to assist in the process, but it didn't cross my mind at the time. Drill press drill a hole slightly oversize in a small block the same thickness and at least 2 inches wide as your item to be drilled. Now clamp the guide you just made and the piece to be drilled onto a FLAT surface. The block acts for centering, alignment and the brass is a bearing to prevent the drill from binding. Drill in a couple of inches and pull the drill to clear chips. Repeat until the hole is complete. Of course this requires one of the extra long drill bits... I have 1/4 inch dia up to 4 feet long. On the age of the boat topic - if the stripes are truly painted on, they are not factory original and won't help to date the boat. If they are gelcoat, then they are original and may help date the boat. BTW, they switched from twin to triple stripes in 1971. They look to be gelcoat to me. I can see that they go under the aluminum trim. I was looking at it yesterday, and there is a slight possibility that the fore stripe was red. I'll have to explore a little more. The stripes are on the front, and there are only two (matching width). I'm guessing the sail is a replacement. It is all white with a black sunfish at the top. They had OEM all white sails with the sunfish logo. We just proved one thing its not though... the 1976. Maybe the stripes were originally like this, found in this thread, How about a Classic Sunfish Rally?? | Page 2 | SailingForums.com Does that help with the production year? Another image that shows the same hull sticker as mine has. You may want to buy a replacement centerboard, there are several people on this board that could sell you a old style centerboard. That board is worn a lot on both the front and back edges and I would not want to shorten the board as the board with what keeps it from side slipping. As was brought up before you can use fill to bring it back to the correct dimensions and then paint it.. It may come to that, but I'm going to do my best to save the original. Might as well give it a shot and see how it feels once in the water. Can square off the back edge, then add on mahogany (that is the right wood) to make up for the lost back and front and reshape the edges. Epoxy, dowels and clamps for affixing the new wood. The board on my 71 boat had really ugly leading and trailing edgesthat were gouged and splintered. The bottom of it was at least 2 inches short from repeated groundings. I think it would have been easier to make a new one, but instead I refurbished my board much as fhhuber suggests. Instesd of dowels however, I used a plate joiner (i.e. biscuit joiner) and attached the new pieces with MAS epoxy. I then used different router bits to form the round edges at the top of the board, and then the more beveled edges of the board that are actually in the water with the board down. Extending the length of the board was tricky, and trying to expalin what I did in words is difficult. I am out of the country at the moment, but will post a picture when I get back. Also, the deck of my boat was stained badly, so I used Soft Scrub with bleach. That helped a ton, but the surface was heavily oxidized and if you looked at it, it got dirty. To get a smooth surface again, I decided to wet sand with a rubber block starting at 320 grit, maybe 220 grit cannot rememember, and worked my way up to 1000 or 1500 and then used a buffer. I was worried about sanding through the gelcoat, but it never happened. It turned out WAY better than I would have thought. You can have a look at the attached picture. It still isn't as smooth as a new gelcoat, but it sure looks good to me. One last thing, I noticed in an earlier post is that you are missing the plastic/delrin tube that covers the carriage bolt in the rudder assembly (i.e the bolt with the wingnut on top.). You need that bit. 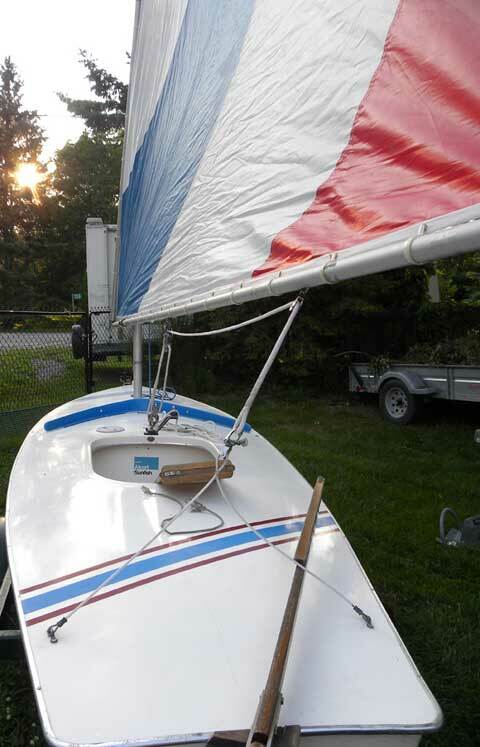 I don't know much about sunfish compared to many on this site, but what I found is without that tube, the bottom rudder bracket can move side to side A LOT, and that will cause the rudder to pop up at the most inopportune times. Since putting that piece in, my rudder never releases unless I want it to. I got the replacement from McMaster Carr. Vinyl tubing also works well for this. A rubber fuel hose would also work. You might have something around the house. Going back to the bailer discussion. If you can obtain a metal bailer, make sure to keep the threads lubricated with something that protects against corrosion. If you can't find one the Sunfish plastic bailer works in the same hole. My 1969 has only been in salt water so a plastic bailer was a better way to go for me. Great information! I'd love to see some detailed pictures when you get a chance. Do you have a link to the part you used? I don't think I've seen it on any of the Sunfish parts sites. Maybe factory replacement NLA? Being a "car guy" I have ton's of tubing of various sizes. Once I figure out exactly what y'all are talking about I can see if something will work. I've read that Alcort/AMF originally suggested lubricating it with Vaseline once a month. I'm guessing any petroleum based lube would work. My Sunfish will likely never see salt water again, but still a good idea to keep the parts moving. Does anyone know the exact thread measurements for the plug? That would be very helpful on my search since I can't exactly take the boat with me (it will make online searching easier as well).